The Frugal Family Life: New 45¢/1 Angel Soft Bathroom Tissue Coupon = ONLY 10¢ at Nichols AND Homeland! 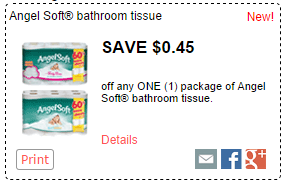 New 45¢/1 Angel Soft Bathroom Tissue Coupon = ONLY 10¢ at Nichols AND Homeland! RedPlum has a new 45¢/1 ANY Angel Soft coupon to print. I love this coupon because when it doubles it will take 90¢ off of ONE package! The 4 packs are always just $1.00 at Nichols, meaning just 10¢ after the coupon! Also, these are just $1.00 per 4-pk at Homeland through 10/11/14. Use the coupon to pay ONLY 10¢ per package there as well!